We still need to answer the question, where does the missing mass in a radioactive decay go? Recall that we said that when uranium decays into thorium and an alpha particle, 0.0046 u of mass appears to have been lost. When uranium nuclei undergo radioactive decay, some of their mass is converted into kinetic energy (the energy of the moving particles). 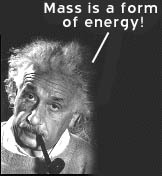 This conversion of energy is observed as a loss of mass.